With the meeting over, I wanted to reflect on the past week. Perhaps the topmost thing on my mind is how friendly and welcoming place Japan is for the IETF. I thoroughly enjoyed the incredibly well working network, the wireless that covered everything all the way to the Ferris Wheel, the ceremonies, the food, all the modern facilities, and the long list of supporters for the meeting. Thank you! We had a very good turnout in terms of participation, over 1300 participants on site at the end of the week. Anything over 1300 is a high number for the IETF, at least when discounting meetings from the dot com bubble era. The largest meeting in recent history was London, which had 1400 participants. Our third IETF Hackathon event had somewhere between 70 and 95 participants, depending on whether you count official registrations or the number of t-shirts handed out. There were a few people new to the IETF in the room as well, and our youngest coder was 16 years old! But like with the overall meeting, the number of participants is not the key metric that we can judge success on. It is the work that gets done that matters, and whether it brings improvements to the Internet. This seemed to be happening: for instance, at the Hackathon there was much focus on key issues in the Internet, be it about privacy of metadata, or ability to build networks easily. You could also see how people learned from the Hackathon. For instance, one team actually failed to do what they wanted, but that failure had a lesson in it, and later in the week the working group in question realised that they have to change their approach. Well done! Each one of the ten teams made a significant contribution, some of the other notable examples include the DNS security and privacy team, who led a professional and systematic approach to securing the DNS infrastructure and eliminating metadata leakage (DPRIVE), and the HOMENET team who had the most impressive demo involving multiple platforms ranging from routers to iPhones. We had only one BOF this time, focusing on synchronisation protocols for Internet-based storage services. The origins of this were in academic research on optimised synchronisation mechanisms, protocols that can improve the efficiency of some widely used protocols. But in the BOF itself the focus was more in the prospect of broader synchronization protocol interoperability. My own belief is that it is of key interest, and potentially very useful, particularly for enterprise customers and third party application developers who would benefit from the ability to switch between providers more easily than today. However, it is also necessary to get interest from some service providers – perhaps from the small players initially. The BOF effort will continue in search of that interest, especially from the industry. Please join the mailing list for discussion! The discussion will continue in DNSOP, hopefully with appropriate interest also from other parts of the IETF. The first goal is to define crisply what the problem with RFC 6761 is. It is unlikely that many other allocations are made before that process is re-evaluated and re-designed. The increase in YANG data models continued, the current count is 160 drafts. 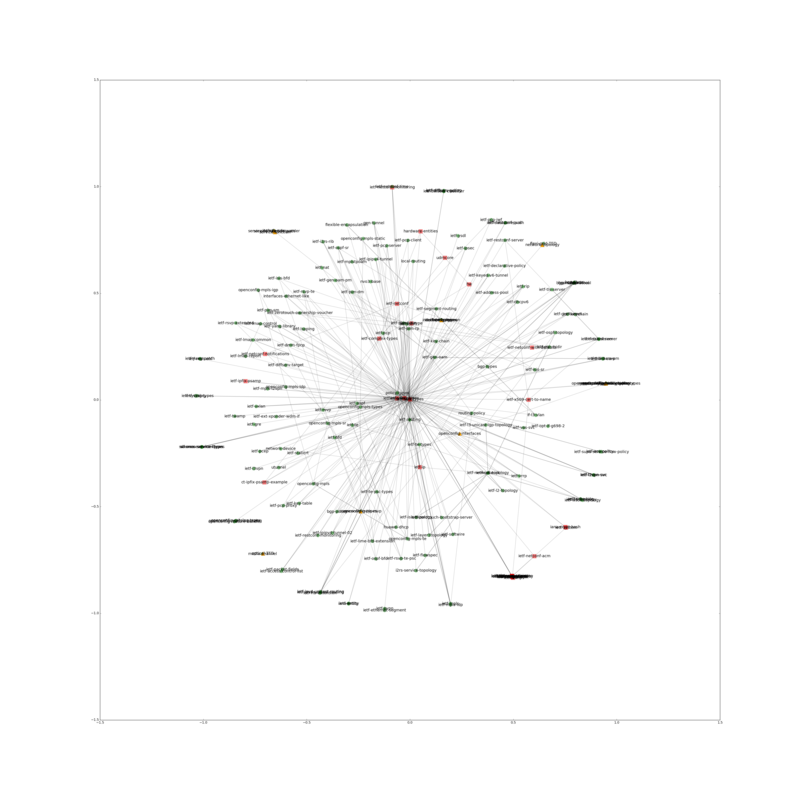 Benoit Claise and his colleague Jan Medved have produced a dependency graph tool that shows the dependencies between the drafts. The security area meeting (SAAG) turned out to have many local presenters. I particularly enjoyed the presentation on security analysis of IPv6 transition technologies and the report from the workshop on impacts of encryption in mobile networks. The DISPATCH working group talked about opportunistic security for RTP flows. This time we experimented with a different setup for community-wide discussions, having one combined plenary instead of separate technical and administrative ones. That seemed like a reasonable starting point for future arrangements as well, although there’s a lot to improve still, such as further shortening of the presentations part. Before the plenary we got a preview of “A Net of Rights”, a short film made by members of the proposed IRTF research group on human rights protocol considerations (HRPC). With the W3C TPAC meeting and the OpenStack Summit both in Japan on the previous week, I think we succeeded in visiting and being visited by a few more key individuals from these organisations. In some cases by folk who had not been recently at the IETF. Having an IETF not tightly bound to another event but happening in the same general area as other things can be useful even in the future. Once again we had many new participants, almost three hundred! We also had visitors from the ISOC policy guest and fellows programs. Many of these visitors are first-time attendees, though often we have worked with them on important topics online. For instance, Seun Ojedeji (Federal University Oye-Ekiti, Nigeria) has been an active member in IANA transition discussion at the IETF and elsewhere, but this was his first in person IETF meeting. Similarly, Rinalia Abdul Rahim (ICANN board, Malaysia) visited the IETF for the first time. As always, the IETF meetings are just events and while they are good opportunities for discussion, any significant effort requires long-term co-operation and hard work outside meetings. We’ve already have that with Seun and Rinalia, but the same is true for all new participants: the real participation at the IETF is a joint project with others, a working group that you care for and contribute to. Hoping to see many of the new participants involved in projects that are important for them! It was also noteworthy that there were many remote participants, including presenters. For instance, Jürgen Schönwälder held an hour-long discussion in the LMAP working group using Meetecho. We also learned some lessons in other sessions, like the plenary where remote connections had problems, and I had not set up backup jabber channels to be monitored appropriately. I apologise for that. Thanks for everyone who was in the meeting in person or otherwise, for our sponsors, and last but not least, the volunteers and staff who made the meeting happen. Thank you! We continue work over the Internet in the coming months. We will meet in person the next time April 3-8 in Buenos Aires, Argentina! Our host will be LACNIC. This will be the first meeting in South America and only the second meeting to be held south of the equator. The IETF community recognises our need to engage with the active developer communities around the world, so I am looking forward to meeting you in Buenos Aires! Note that the Buenos Aires IETF Hackathon will run April 2-3 on the weekend preceding the IETF, so be sure to be on site early! Our meeting materials are available online. The information page for the Buenos Aires meeting is here.